Deprecated function: Function create_function() is deprecated in eval() (line 1 of /mnt/target03/362662/www.americansuperstarclothing.com/web/content/modules/php/php.module(80) : eval()'d code). Deprecated function: The each() function is deprecated. This message will be suppressed on further calls in menu_set_active_trail() (line 2405 of /mnt/target03/362662/www.americansuperstarclothing.com/web/content/includes/menu.inc). Shipping Cost: $5 for ground shipping anywhere in the U.S. Ordering Information: Send us an email and we'll be happy to assist you. We accept Pay Pal and checks for payment. Description: Dress like a celebrity with a finer twist on a classic girl's t-shirt style. 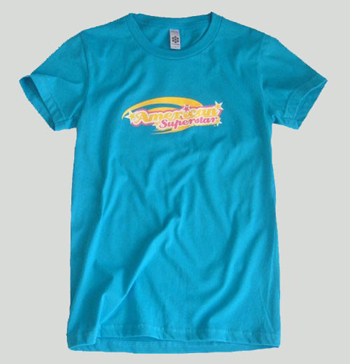 Made with the finest jersey cotton to fit every woman's curves, this stylish teal tee features the American Superstar retro logo to help current and future superstars look and feel extra cool. Copyright © 2006-2018 American Superstar Clothing. All rights reserved.